Window Cleaner Safety When Using a Pole. 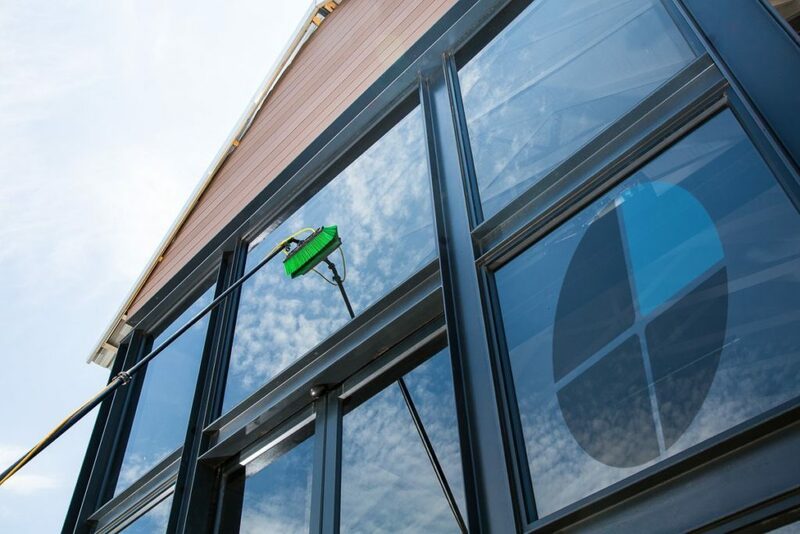 For the average window cleaner, pure water window cleaning is becoming more popular. This is the most common application for pure water window cleaning. The water fed pole is quickly taking the place of the squeegee for exterior window cleaning services. When you compare traditional window cleaning too water fed pole window cleaning, the safest choice is clear. Water fed poling is much safer than traditional window cleaning from a ladder. As a matter of fact I would have to say cleaning with a water fed Pole is infinitely more safe then getting on a ladder. Call Gleaming Glass at 918-850-9798 to see the pole in action. No doubt, The water fed pole has a learning curve to it. Be that as it may, most tools have learning curves to them as well. In my opinion the learning curve with this tool as well worth it. The time it takes to learn how to use the pole far outweighs the dangers of climbing a ladder for every window. In most cases a water fed pole can also achieve better results on the window as far as cleanliness goes. There are many window cleaners who get frustrated during the learning curve. I know of many cases in which a window cleaner gave up altogether. There are many things to learn when cleaning with pure water. The part of the cleaning process that’s hardest is rinsing. You have to make sure you don’t get water on the top window frame. Safety training for a window cleaner. Regardless of the window cleaning task being performed, you should be trained. By the same token, this rings true for the water fed pole. You should know how to properly use a water fed pole before taking it out. If you buy one and learn how to use it on a customer’s windows, you will be disappointed. Ironically, you will spend more time cleaning that customers windows then you would have with traditional cleaning methods. In the first place, if you would have just practiced on your own windows and perfected your technique, you would be happy with it. There’s a good chance your customer won’t be very happy with your work either. It’s important to know how what you need to scrub glass in order to clean it. Consequently, your customer will not be happy with your work. Safety education for a window cleaner. Education should be your first priority when it comes to potential risks and safety. Safety education should be your primary line of defense. Do your research and see if anyone is offering any Online safety courses. Simply Google water fed pole window cleaning safety course. After you place your order for a new water fed Pole, this is the first step I would recommend taking. Watch as many safety videos in general videos on how to properly use a water fed Pole. That way, by the time the pole actually arrives in the mail you will know how to use it. As a result, you will be able to hit the ground running. On the other hand, there’s a good chance you will still run across many areas for improvement. The more and more you use it, the easier it will become. On some jobs, there is a risk to bodily harm for the window cleaner before the job even begins. For example, the window cleaner should be aware of any accidents that might occur from carrying the various heavy equipment. A water fed pole in pure water system has a lot of heavy equipment. If your equipment setup requires you to carry equipment from the truck to your customers home, be careful. In my opinion, it’s best to have a system that is mounted on your truck or van. As a result, you don’t have to risk injury to your back. However, if you don’t have that luxury flex your core when carrying heavy equipment. You might need to carry a water tank, filter systems, or even upwards of 300 feet of hose. Never bend over at the waist to pick things up. Bend at the knees and lift with your legs. Trip hazards are one of the most common drawbacks to water fed pole window cleaning. Avoiding trip hazards is important. The water fed pole in and of itself is a trip Hazard to begin with. Ironically, the hose that carries the pure water to the water fed Pole will trip you often. If you’re not paying attention to the hose while you’re cleaning a window it can get wrapped around your leg. Consequently, when you go to clean the next window you get tripped up. My opinion though, falling while your feet are on the ground is much better than falling from the top of a ladder. Not all accidents are foreseeable but maintaining an awareness of your surroundings will help dramatically. Another tip is to methodically and strategically layout your equipment in a way that it’s not going to trip you up. Ultimately, thinking ahead is key. Public access to work area. It’s important to eliminate the amount of public access the general public has to your work area. If you’re cleaning second or third story windows make sure to block off the area below the windows. In addition, you might even put out slip hazard signs so people know not to run through your work area. You must consider the safety of people walking by you as you work. If need be, obstruct designated areas where you are working to prevent pedestrians from accessing that area. All of the pure water you use while window cleaning can quickly create let pathways. These walkways are unsafe for people walking by. You even run the risk of a potential lawsuit if you don’t do everything in your power to protect people walking by. In addition to causing harm to themselves, pedestrians can cause harm to you too. Ultimately, just stay aware. What is the most serious risks you run with using a water fed pole for pure water window cleaning is electrocution. Electrocution hazards are a very serious matter and should not be taken lightly. As an operator, you need to be aware of all of the power lines around you. Most water fed poles will conduct electricity due to the materials they are made of and all the water being used. A pole doesn’t even have to touch a power line for the power to jump from the line to the pole. It’s important to not even get close to a power line with a water fed Pole. In the event that your pole starts to fall into a live power line do not try to stop it. It’s best to just let it fall. Sure it’ll cause some damage, but that’s better than you losing your life. A more common risk you run by using a water fed pole his injury to your body. The injuries pale in comparison to the injuries that are possible with a ladder, but it’s still something to consider. Anything from stress to fatigue are common. I can attest to this personally. I’m a really skinny window cleaner and I don’t have much muscle but I’m working on it. Consequently, I have to use all my strength to properly use a water fed Pole. Sometimes you have to clean Windows a weird angle. As a consequence, muscles that you’re not he’s too using get used a lot. Incidentally, those muscles are overworked because they are not used to the stress. To avoid the stress, it’s best to use fluid motions in techniques. Don’t just use your arms to move the pole. In other words, use your whole body to move. Another serious risk you run with using pure water window cleaning methods is disease. More specifically, Legionnaires disease. Harmful bacteria that are called Legionella bacteria can be found in some water sources. In small doses the bacteria is harmless. As the bacteria begins to multiply they can cause serious harm. The disease can be contracted by inhaling the bacteria through mist or small water droplets. Furthermore, the water filtration system is a perfect ecosystem for this bacteria. The filter housings allow the bacteria to be in the shade 24/7 and have a very moist environment. There’s also a large build-up of scale, much, and sediment build up in the filters. This particular kind of bacteria thrive in this environment. To avoid contracting the disease, it’s important to change your filters out regularly. It’s also important to store your water filters in a cool place when not in use.